Today I have a little blog for you about something in the fashion world that I am loving at the moment and that is stacking bracelets. Now as I am sure many of you know, the boho, hippie and 70s trend is in at the moment with a lot of emphasis on ethnic patterns, flowing skirts and hippie jewellery. But, if you are a bit worried about going all in with the floppy hat, crochet dress and floral crown don’t worry because stacking bracelets is a great option to instantly make you look up to date without having to go to far. You could easily pair it with a white dress, a t shirt and jeans, a kimono or even a kaftan on a Summer holiday. So to give you an idea of what I mean when I say stacking bracelets, I basically mean when you get lots of different bracelets they are usually beaded ones, ones white tassels, silver beaded ones, shell bracelets, leather wrap around cuff bracelets, woven bracelets. You can easily get them from high street places like Primark, New Look and Accessorieze as well as from more editorial designers like Soru, Chlobo and Anushka Woods. You want to get a nice little cluster of them all in the same theme or metal colour or tone of colour like if you have a pastel pink bracelet make sure to only have pastel pink and silver jewellery. You can have anything from 5 up to 15 bracelets I would say depending on the size and type. Never have them in even numbers like a 4 or 6. 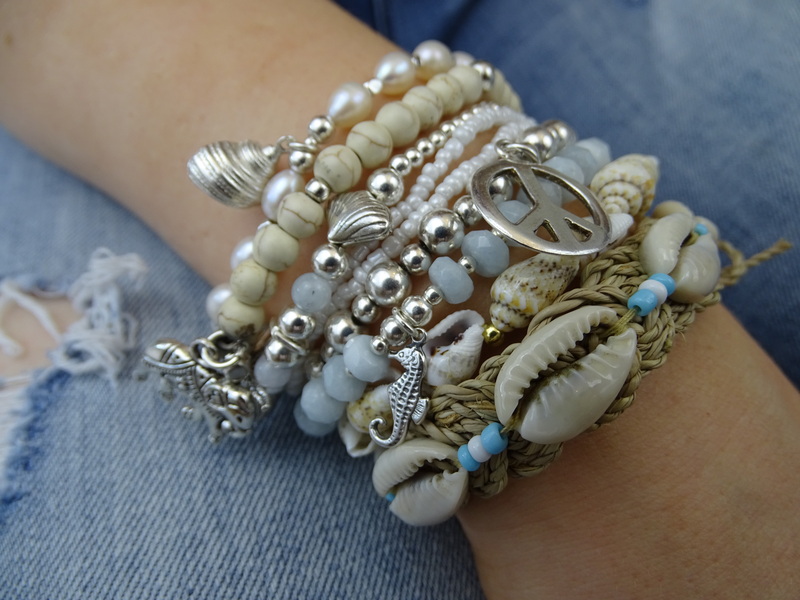 This is a picture of a few of my bracelets that I stacked to show you how I did it one is a shell bracelet with a cord tie from Etsy with tiny little shells, white and blue beading between each shell and detailed with rope for that coastal fee. The other one is a simple shell bracelet I found in Claire’s Accessories. I have 3 bracelets from Tigha Jewellery all with silver beads and semi precious stones click here to view a blog on it. I also have a silver beaded bracelet with a silver peace symbol charm on it from Chobo and a little cream beaded bracelet with a silver elephant charm from Etsy. So, I hope this little blog has inspired you to try out your own version of bracelet stacking, ring and necklace stacking is also popular at the moment too. But, for me personally I favour to stack my bracelets most of all. Let me know in the comments if you found this useful and i will see you all next time!